Be left star struck by this glamorous Hollywood themed slot! The mood is set by a fantastic trailer, with 3D graphics transporting you to an awards show venue. This unusual theme really works. The experience is made all the more immersive thanks to a lilting backing track which is reminiscent of a black and white Hollywood movie, and one almost expects Fred Astaire and Ginger Rodgers to come waltzing across your screen. The symbols include traditional card suits, reels of film, the Hollywood hunk, and the leading lady. However, the real stars of the show are the cute cartoon representations of a movie crew. These include the make-up artist, stunt guy, tech man, and the cutter. With 243 winning combinations, what are you waiting for! Check out our entire list of fruit machine game now. Elk Studios has a reputation for quality over quantity, meaning we wait in eager anticipation for their releases. This strategy has paid off – in 2017 they won ‘Game of the Year’ for Wild Toro, a slot themed around a matador and the feisty bull he spars with! This eye for quality and dedication to exceptional visuals has successfully been applied to Bloopers. If you enjoy Bloopers, you should also check out their wildly successful DJ Wild slot which features a similar entertainer theme! If you love promo's, get the best promotions at online casino today. Players are sure to have stars in their eyes (or maybe dollar signs) when they hear that this five reel game offers 243 paylines. 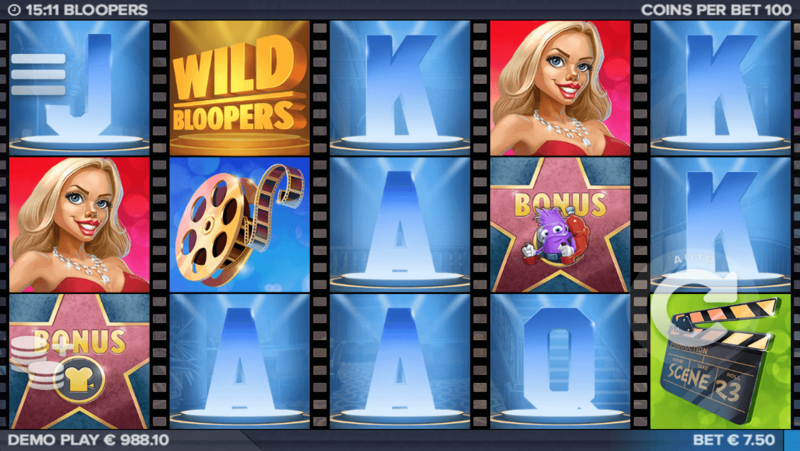 Free Spins – these are triggered when three or more ‘Bonus Stars’ (the Scatters) appear on screen. 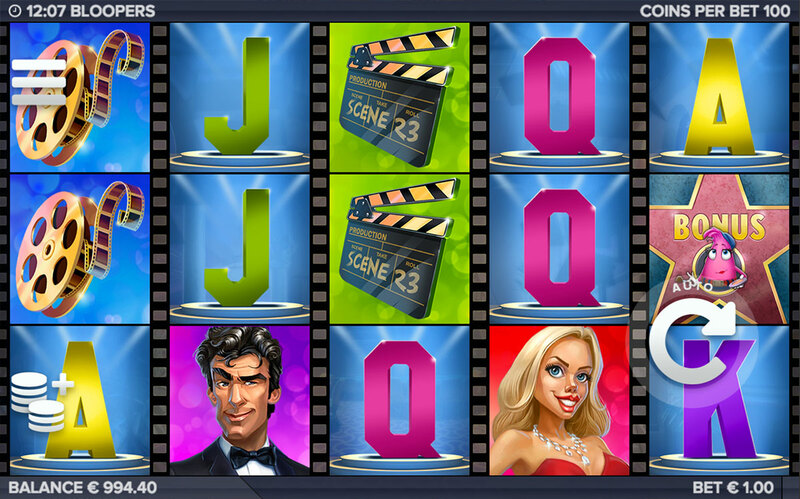 During free spins rounds, the male and female movie star symbols turn into ‘Sticky Wilds’ if they appear on reel 2, 3, or 4. Your bonus game ends when these Sticky Wilds cover all three positions on these three reels. Wilds – the Bloopers (cartoon crew) are the Wilds which can bring you various bonus features. The blue stunt man promises expanding wilds, the green cutter blooper gets you falling symbols, the pink make-up artist triggers free spins, and the purple fix-it character will give you symbol shuffles. Meanwhile the tech guy offers you random wilds. Players can look forward to fairly frequent wilds and scatters. I loved the glitz and glamour of this slot, and like all the best movies it has visuals to die for. Elk Studios have maintained their reputation for quality over quantity. It is especially nice touch that the game reels have been styled to look like reels of film! The reels take up the whole screen with no visible background during play, offering you the full wide-screen experience! The cartoon crew symbols are really cute and I love how well their personalities are represented. This in addition to the stellar 3D graphics and the soothing backing track combine to create a really immersive experience. Players will be transported between a movie set and the red carpet! With autoplay modes and automated betting strategy options, this game is friendlier to beginners than it might initially seem.